Here are the online sections referred to specifically in The Adult Student’s Guide . For more information, see the book! — (Page 46). Hey, what do all those symbols and abbreviations mean?? 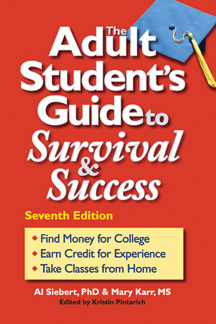 Take the Resiliency Quiz — (Page 142). Online version, courtesy of the Al Siebert Resiliency Center. FAQs returning soon. View archived version from the Internet Archive WayBack Machine.